“Now for the birds,” he replied sleepily. Goa’s susegad air seemed to have worked well on him. “But where?” I nudged him. “You are the researcher, you do the research.” He then rolled over and started snoring. I quickly browsed through some sites and before I knew it, I had fallen asleep, too. It was 6.00 am when I woke up with a start. The husband, surprisingly, was already awake. “Where to, then?” he asked. Morjim beach is what I found myself saying and Morjim beach was where we found ourselves at around 7.00 am in the morning. The beach is a nesting and hatching habitat of the endangered Olive ridley sea turtles. The Tourism Department has strived to aid conservation efforts by restricting temporary seasonal structures (like shacks) to a portion of the beach and requiring them to operate only during daylight hours. It was a dull, grey morning that day, the sky threatening of a downpour. We parked our car along the estuary road and started walking towards the sea. There was a strong wind blowing and the water was rough. I walked on at a leisurely pace and was soon left behind by the husband and the son. The estuary was solemnly desolate, except for a lone soul who was practicing something which reminded me of Po from ‘Kung-fu Panda’ looking for ‘inner peace’. It was a fascinating sight as the man moved his limbs ever so slowly, carrying out various postures. I think I recognized the crane pose as he balanced himself on one leg with his arms spread out. I stood rooted watching the stranger perform his calisthenics, something which might be a part of his daily routine, and almost forgot that I was there for the birds. A frenzied gesture from the husband broke the spell and I tried to catch whatever he was trying to show. 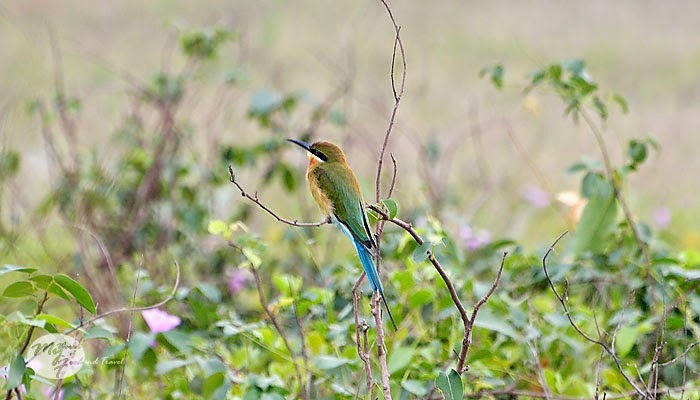 There stood a little bird some distance away by the side of the backwaters. 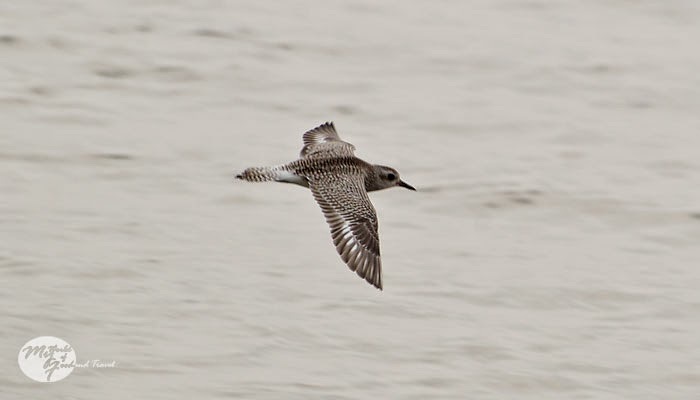 Our first pacific golden plover, in non-breeding plumage. We did not know its name till much later as all the birds we saw that day were unfamiliar to us. We had never come across them in landlocked Bangalore. I walked ahead and soon the estuary merged with the sea, a beautiful sight to behold. The sea was a scene of seething waves as huge waves crashed against the hill on the far side. There were tiny crabs scurrying about on the beach, hurrying into little holes in the blink of an eye. “Snake!” shrieked my son and pointed towards a dead eel lying inert on the beach. Hurry, take cover, li'l crab! 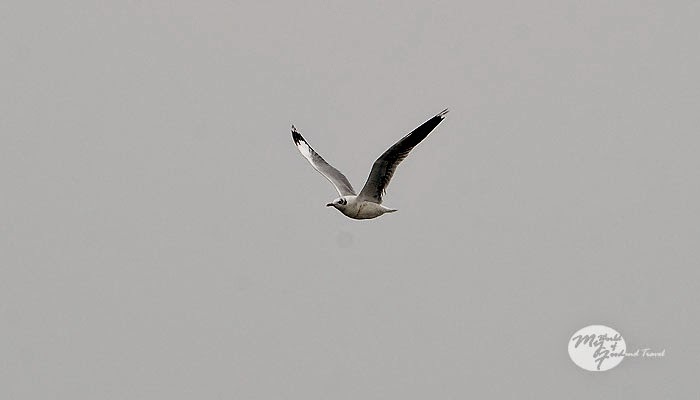 I looked up to see flocks of black-headed and brown-headed gulls fly by. 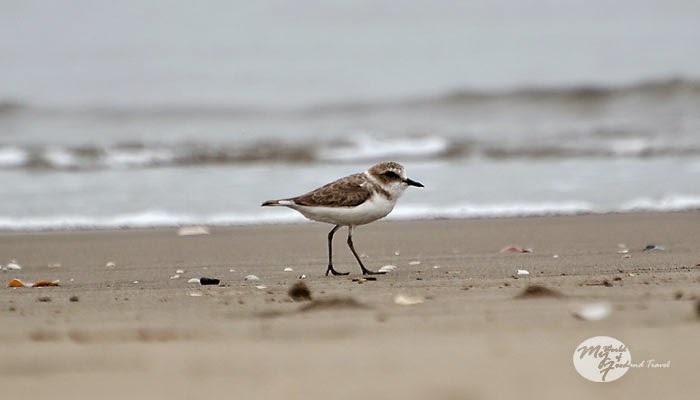 The same sea birds were congregating at Maguri Beel and Deepor Beel in faraway Assam, too. How strange, I said to myself. 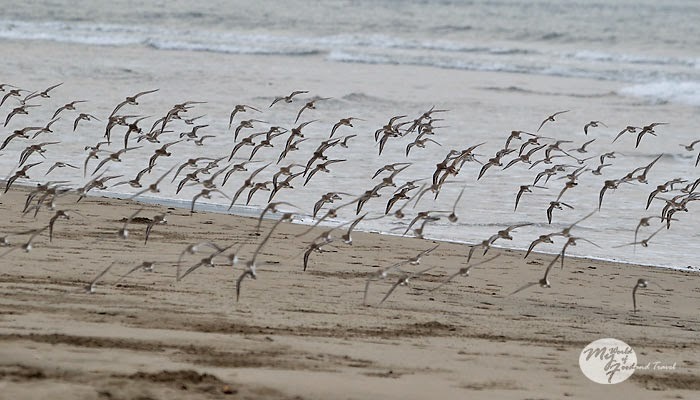 Suddenly, some flurried movements on the beach caught my eye. 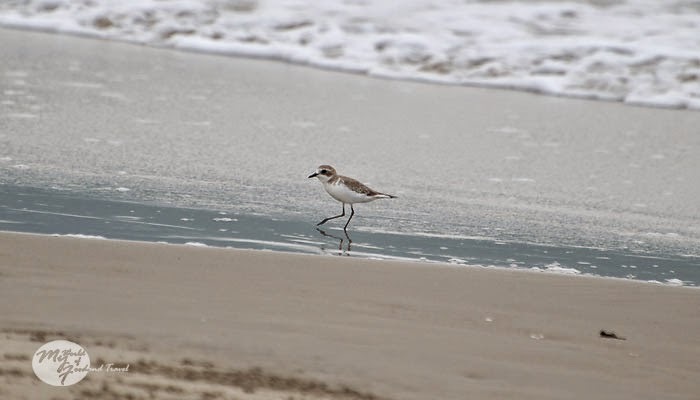 A few tiny birds were scuttling about near the water, picking out some tidbits, and then running away comically when the waves approached. Kentish plovers, I knew them from their pictures posted on birding forums. I turned around to show them to the husband but he was already busy clicking away, lying flat on the ground. 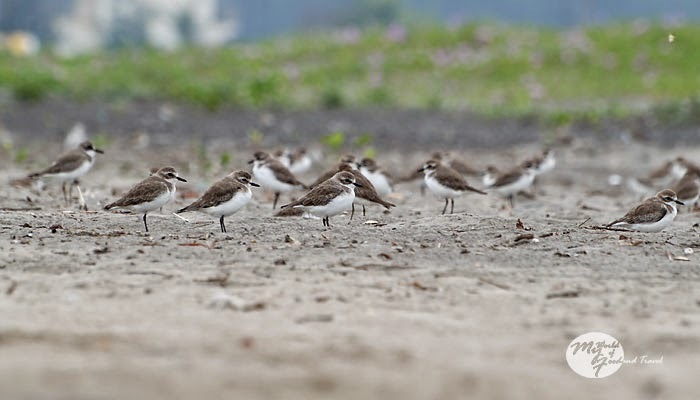 A Lesser Sand Plover? Or a Kentish, still? I was a bit perplexed at what he might be shooting. 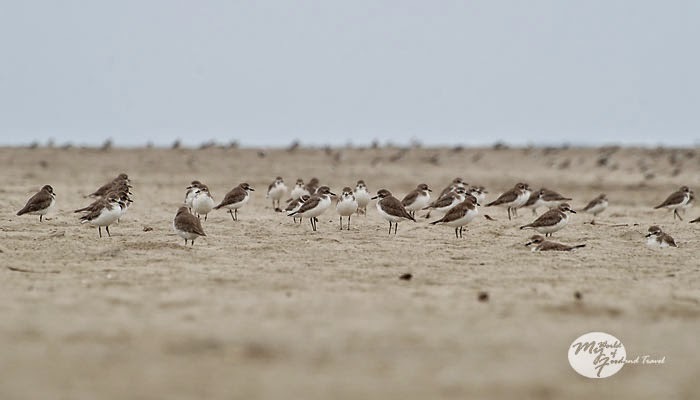 A closer look showed me a big group of Kentish plovers (and lesser sand plovers?) assembled on the sand. They were standing quite still and if one moved and changed direction, that affected the whole group, too. They were quite a quirky bunch and it was interesting to see their behavior. Our little brat was tickled to see his dad lying on the ground and he gleefully plonked himself upon him. The poor husband could not even shout at him for fear of scaring away the plovers. The son then tried to emulate his father and it made quite a cute sight to see both of them crawling away on the sand. A few feet away there was another group observing the flock of plovers. They were foreigners and appeared to have engaged a professional birder. Perhaps we should do the same, some day. The beach had a small patch occupied by shacks and thankfully did not seem like they were too popular with the beach revelers. These little birds needed their own space, too. As per rules, owners of the shacks are legally obliged not to leave any furniture on the beach after daylight hours as it might adversely affect marine turtle conservation. It was almost 9 am and our tummies started grumbling audibly. We decided to turn around and suddenly realized that the tide had risen. 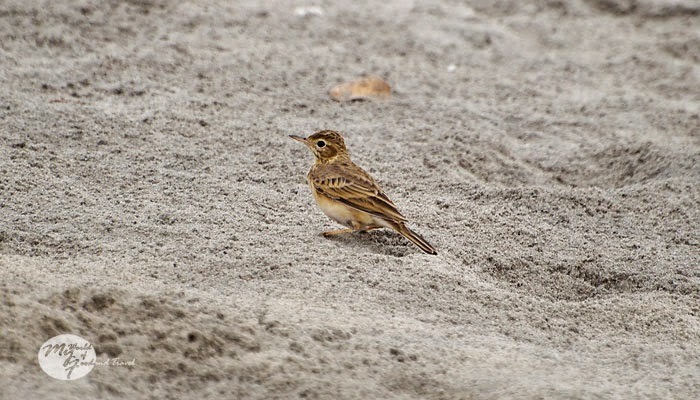 As we navigated our way through the weed-like growth on the beach, we spied a few Blyth’s pipits flying about restlessly. Till then we were friends only with the paddyfield pipits. We lingered on for a few more minutes to catch up with them while they blended in with the undergrowth effortlessly. The water had stolen up to the boats tied to the estuary banks and we had to ‘tip toe’ our way around them. Just as we were about to start the car, a pair of parakeets noisily perched themselves on a tree stump some way off. I had almost dismissed them as the common rose-ringed ones when their size caught my attention. No sooner had I recognized them as alexendrine parakeets that they decided to fly off leaving me a frustrated woman with a poor grainy image. We drove around Morjim beach, not willing to leave it, although hunger pangs were making their point quite disconsolately. It had been a beautiful morning for us. Not too many birds to show, but you know how you feel when all the birds you saw were lifers, right? Yeah, that was it – we were so happy. We bade goodbye to Morjim beach, peeping at it through the casuarina growth, and made way for our next destination. 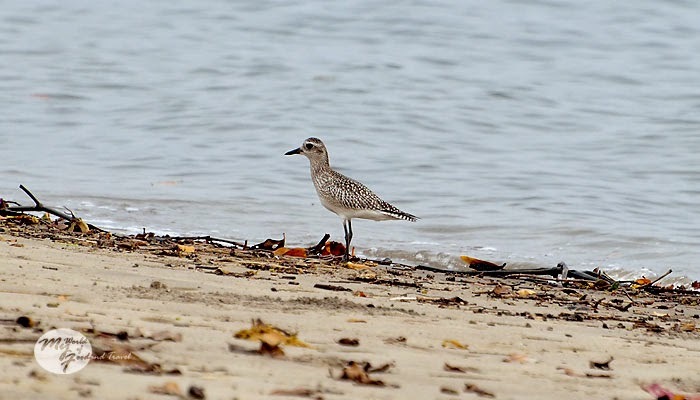 Isn't that the Grey Plover...?